My 2 year old has really taken a liking to the book, Put Me In the Zoo . The playful rhyme and silly main character make a great engaging story for little ones. 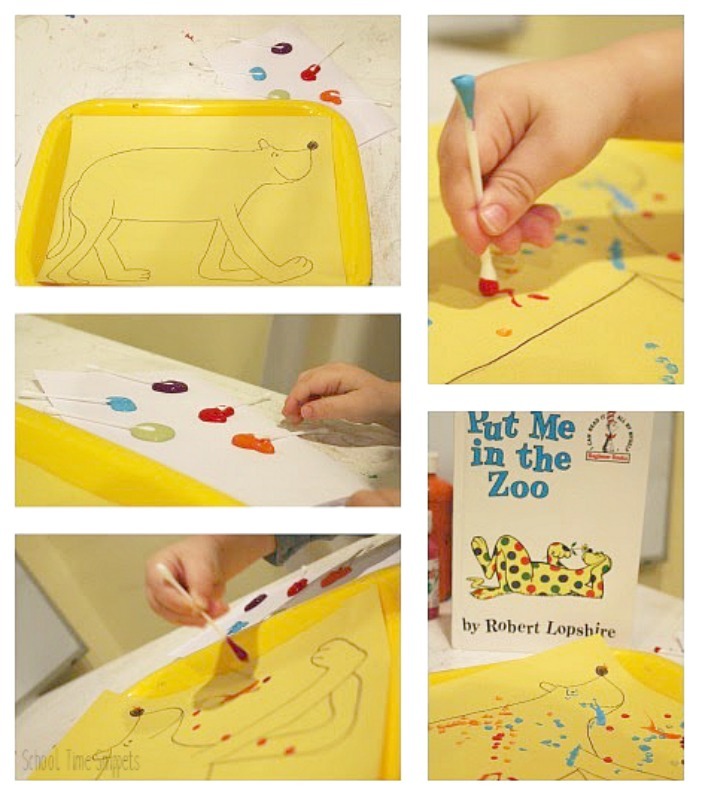 To extend the story, I put together three Fine Motor Activities to go along with, Put Me In the Zoo with my toddler in mind, but these fine motor activities would be great for preschoolers, too! 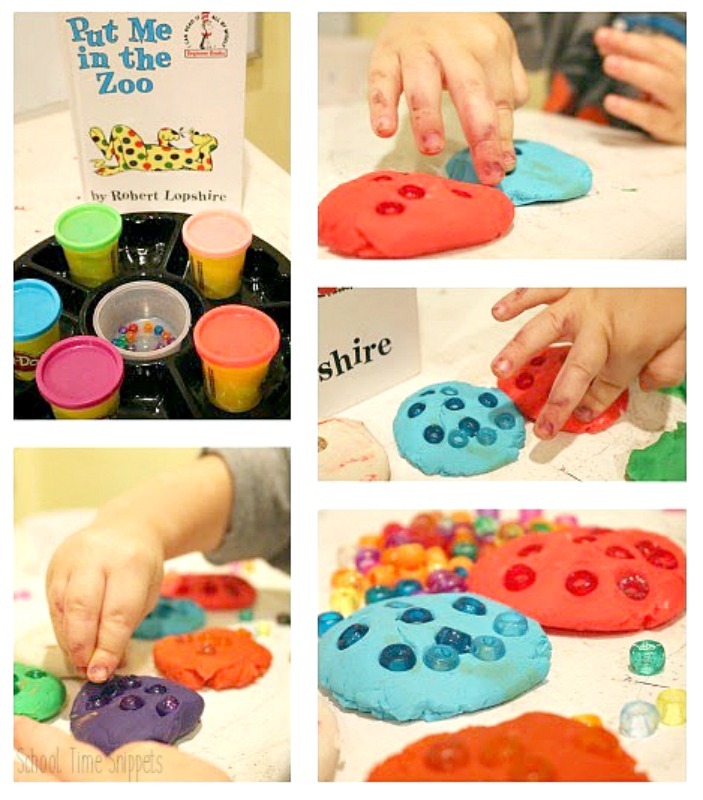 Enjoy these fun, hands-on activities that work on strengthening those fine motor muscles! 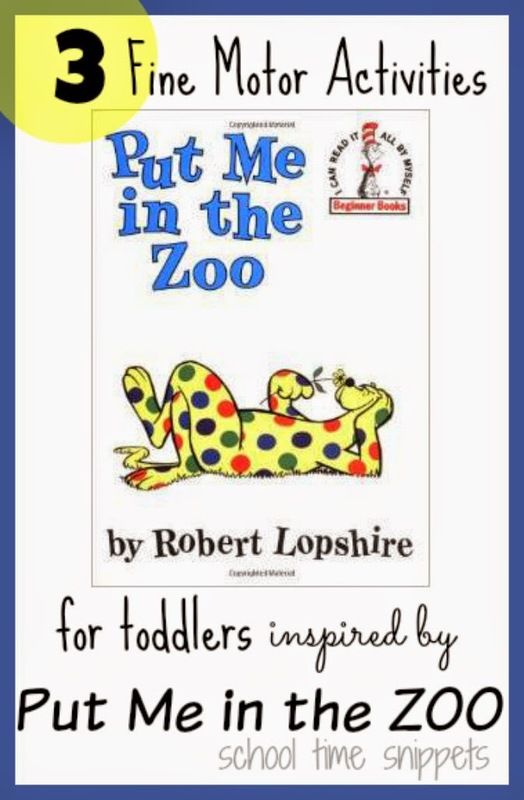 Put Me in the Zoo is a playful book about an animal wanting to stay in the zoo, however the zoo-keepers say, "Out! Out with you!" Saddened that he was kicked out of the zoo, he shows off all the things he can do with his colorful spots. 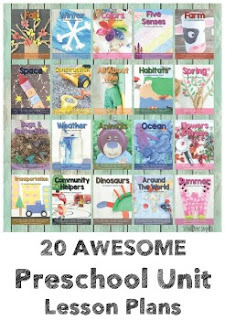 I adore this Dr. Suess book as much as my toddler! After reading the book, have some Dr. Suess inspired fun sorting spots and making an animal craft all while working on fine motor skills. Easy to set-up sorting activity using tongs and pom poms , aka "spots." I placed red, blue, orange, green, and purple pom poms in the center of the tray, and my toddler was to manipulate the tongs to pick up the pom poms and put each color in it's own section in the tray. To prep this activity I drew the main character of Put Me In the Zoo by hand on a piece of yellow paper. I provided my 2 year old with q-tips and red, blue, orange, green, and purple paint . Next, I encouraged him to "add lots of spots." I provided my 2 year old with pony beads and playdough . I set out the playdough in flattened balls and had my son match the pony beads to the playdough. He loved pushing the beads into the playdough!